Planks butted edgewise with beveled & fitted edges. No other method of sealing other than caulking. The primary means of sealing is swelling of the wood. With age, very prone to leakage and fastener corrosion, to which all areas of the bottom are subject. Required great deal of construction skill to make a leak free hull. Utilizes a batten over seams on inside. A very effective and strong method of construction, used mainly by Chris Craft. Same as carvel only uses light inner layer with heavier outer layer, parallel longitudinal. Vastly superior to single carvel. Much less prone to leaking, working and fastener failure. Most often seen on PT boats and minesweepers and Huckins Yachts. If heavily fastened, this method very strong and long lasting. Both edges and centers of planks need to fastened to prevent warpage. If not heavily fastened, planks subject to cupping because of thinness of planks. followed by water leakage transmitted in the void spaces formed by the warped planks. In that case, were highly prone to deterioration and fastener failure. Warped planks spell big trouble. Another very effective method that is very good at keeping fasteners dry. Used mainly by Chris Craft. Very strong, long lasting. This method utilizes longitudinal hull side planking and transverse bottom planking. Vessels built mainly for fishing in protected waters of Chesapeake Bay and Carolina sounds. A cost saving method that greatly compromises vessel strength. Often steel nailed. Not meant for ocean use, short-lived. Usually three plies of thin planks in di or triagonal laid up with resorcinol glue and small nails of monel, copper alloy or bronze. Smaller boats used staples. Makes for very strong hull but subject to the same warpage and water ingress problems as double diagonal. Because of molded nature, fastener problems are usually not relevant but hull shell deterioration is. This material has gained a bad reputation because of a great deal of bad design and poor quality plywood. Good quality plywood is little different than cold molded material, and is superior in that it doesn't warp. Marine grade ply using mahogany or fir is extremely expensive and not often used. In recent years, plywood hulls built with. epoxy glues and resins have proved capable of producing hulls with 30+ year life spans, but only if done right. Lydia of Florida and several other head boat builders have produced some noteworthy examples. The prevention of leakage and sealing of panel edges is critical. Larger boats with double layers are very strong. Appears in a variety of forms including edge nailed and the West System. Usually the strip planks are glued on edges and nailed. Produces a very strong, long-lasting hull, not prone to leakage. West System uses large amounts of epoxy glue and is highly rot resistant. Both these types tend to be monolithic and will tolerate a great deal of fastener failure before structural failures will occur. Longitudinal planking with edges overlapped. Produces a hull prone to wracking and leaking seams and therefore fastener failure. Not many of these around anymore. CFR 46, Subchapter T requirements for safety and life saving equipment are woefully inadequate. Many private yachts voluntarily have better safety equipment than what Subchapter T requires. Compartments Regulated vessels should be required to have no less than three water tight compartments, designed so that should any one compartment be completely flooded, the other two are capable of maintaining the vessel afloat. This is easy to achieve and usually involves little additional cost. Bilge pumping requirements are completely inadequate. Most yachts have better pumping systems than inspected vessels. A standard needs to be developed that addresses the numerous factors that go into making up an effective system. Inspected vessels should have both primary and emergency pumping systems, as do many yachts. Adequate information is available and retrofitting costs would not be excessive. Marine surveyors are routinely recommending of the installation of bilge high water alarm systems in yachts. Many yacht builders provide them as standard equipment. Such systems can be installed at very low cost and should be mandatory. It is criminal that CFR 46 does not require life raft capacity for the total passenger carrying capacity of the vessel. It should. Further, life rafts must be capable of keeping victims out of the water, meaning no bottomless life rafts. The high cost of immersion suits can be avoided if sensible life raft requirements are adopted, combined with a requirement for water resistant wind chill protection such as water resistant "panchos" or blankets. The Japanese have developed very effective, small chemical heat packets. These are about the size of post card, designed to be placed in clothing pockets, and are very inexpensive. They last 4-6 hours and combined with wind chill protection, would go a long way toward reducing deaths associated with extreme loss of body heat and hypothermia. The EL TORO victims were in the water for as long as 80 minutes even though the vessel sank within 15 miles of one of the highest concentrations of marine search and rescue agencies, stations and equipment. Had this accident occurred in a more remote area, or out on the open ocean, it is entirely possible that there would have been no survivors. By no stretch of imagination did the vessel operator act responsibly by taking the passengers out in the face of posted gale warnings. All necessary weather information was readily available and the tragedy would not have occurred had the operator heeded the warnings. A huge body of data exists linking vessel design and construction to sea capability and survivability. The designation "small craft" needs to be further defined and vessel capability linked to predicted weather conditions. Known as E.P.I.R.B. 's - Emergency Position Indicator Radio Beacons, these devices are voluntarily carried by most offshore yachts and should be mandatory on public conveyances. Their value is not only in allowing rescuers to locate offshore vessels quickly, but permitting more rapid location in fog, rain and other low visibility conditions. These should be mandatory for every life raft. First posted 5/25/97 at David Pascoe's site www.yachtsurvey.com. Edited it for this site. David H. Pascoe is a marine surveyor (retired) with 40 years' experience. 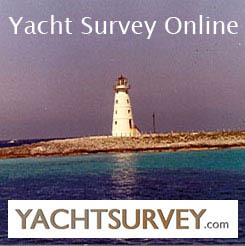 Visit yachtsurvey.com for more than 160 online articles. How to Decide if Buying an Older Boat is Right for you. To Buy or Not to Buy . . . .A Blistered Boat, That Is. Articles, Images - Copyright ©1996-2018 David H. Pascoe All Right Reserved. Web Site Design - Copyright ©1996-2018 D. H. Pascoe & Co., Inc. All Rights Reserved.